Mentor Me India helps over 250 children in low-income communities grow to their full potential by supporting enduring one-to-one relationships. 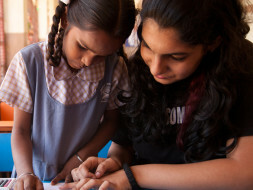 Mentor Me India is a non-profit organization founded in 2013 by students at Harvard and education professionals in Mumbai with a mission to empower children in low-income communities grow to their full potential by supporting enduring one-to-one relationships with strong role models. Too many children in India grow up without role models. Parents are often working around the clock, and cannot provide academic support, career guidance, or other resources to help their children develop and reach their dreams. Teachers often manage over 40 children per class, and cannot provide personalized attention. What does MentorMe India do? Many children in Mumbai are stuck in a cycle of poverty. On the other hand, there is a growing social consciousness among Indian professionals. More and more people are looking for meaningful ways to give back to their societies. We connect children typically aged 9-12 from a low income community with a mentor who inspires them, believes in them and guides them. At the same time, we provide mentors with a unique opportunity to change the life trajectory of a child forever, training and on-going support to strengthen them as mentors, and a network of similarly motivated and talented individuals to connect over a special shared experience. We are currently supporting around 250 mentor-mentee pairs across Mumbai, including street-living and orphaned children. With your support, we hope to double our reach and impact by the end of this year. Your contribution will go towards enabling 40 mentor-mentee pairs in one of the most vulnerable communities in Mumbai, Govandi, by support their training and program costs and empowering those mentees to reach their full potential. I am Ibrahim, a Milaap Open Fellow. I recently got invited to MentoremeIndia's event 'Big MMI Day', an event held at a public school in Goregaon, Mumbai. I met a couple of members of the team as well as a few mentor-mentee pairs. Sharing my experience with you via a blog post.